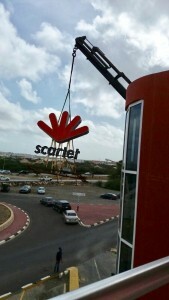 WILLEMSTAD - The Court of First Instance of Curaçao, declared the telecommunication company Scarlet bankrupt yesterday. This puts an end to a few noisy and uncertain months for both the employees and the company’s customers. The Court decided to declare the company bankrupt because after the deferment of payment was granted on July 21, the debt position did not improve but even worsened. The 34 employees and, like Paul Gelderloos, Scarlet's managing director, indicated to the court by email, “the 3,000 customers now know, where they stand”. With the provisional postponement of payment, Gelderloos thought that he would prevent the network provider Digicel from shutting down their business from the network.